Colombia has significant natural resources and its diverse culture reflects the indigenous Indian, Spanish and African origins of its people. But it has also been ravaged by a decades-long violent conflict involving outlawed armed groups, drug cartels and gross violations of human rights, although since 2002, the country has made some progress towards improving security. 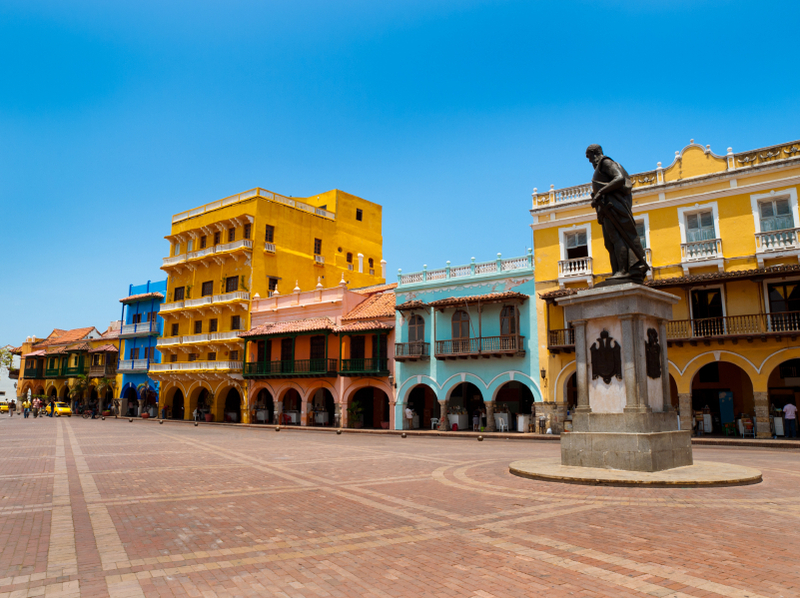 The fourth largest country in South America and one of the continent’s most populous nations, Colombia has substantial oil reserves and is a major producer of gold, silver, emeralds, platinum and coal. It also has a highly stratified society where the traditionally rich families of Spanish descent have benefited from this wealth to a far greater degree than the majority, mixed-race population. With few avenues for social mobility, this provided a natural constituency for left-wing insurgents. However, the lucrative returns from drugs and kidnapping came to dominate the rebels’ agenda, and largely replaced ideological motivations. The conflict has dragged on for decades, and at one point the government effectively lost control of large swathes of Colombian territory to the rebels, especially in the north and east. However, since 2002 the government has managed a string of spectacular successes against the left-wing rebels, regaining control of much of the rebel-held territory and raising hopes that the conflict may be drawing to a close. The government has been leading efforts to rebrand the country and shake off its image as a trouble spot associated with drugs and kidnapping. It says major advances have been made in security, demobilisation of illegal armed groups, drug eradication and economic development. It said in early 2012 that 94% or country was safe for travel and that only 6% of its territory was under potential threat from terrorist groups or organised criminal bands. Some travel writers also say that the ”country has left the mess of 15 years ago behind” and that it has much more to offer the traveller than turmoil and strife. Several foreign governments, however, maintain travel warnings. The US State Department says that security has improved significantly in recent years, but that violence by narco-terrorist groups continues to affect some rural areas and large cities. Britain’s travel advisory in early 2012 says that there is a high threat from terrorism, with continued, indiscriminate attacks targeting government buildings, public transport, public spaces, and other areas frequented by foreigners. Critics argue that while weakened, the rebels’ backbone has not been broken, and that the underlying causes of the conflict have not been tackled. New illegal armed groups have also arisen, and little progress has been made in combating drug-smuggling. At the other end of the political spectrum from the left-wing rebels are illegal right-wing paramilitary groups, who are sometimes in the pay of drug cartels and landowners, and have at times been backed by elements in the army and the police. Many of these groups, which have have targeted human rights workers, peasants suspected of helping left-wing guerrillas, street children and other marginal groups, have demobilised under a government peace initiative, but there are doubts about how genuine the process is. The US, a key market for Colombian cocaine, has bankrolled the fight against the trade to the tune of billions of dollars. But critics say “Plan Colombia” has had little impact on the supply and price of drugs.